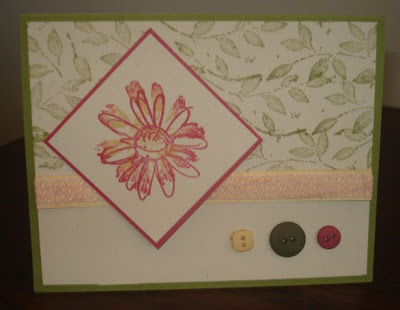 So I came across these cards earlier today while I was preparing for tonight's Stampers Club class and realized I never got last month's posted to the blog, so here they are. 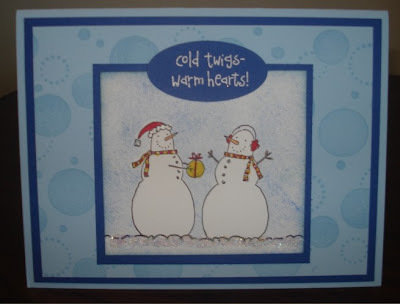 The first card used the Jumbo wheel "Spot On" and the "It's Snow Time". We added Dazzling Diamonds glitter to the "snow" on the bottom.. 'cause I do so love a little bling! 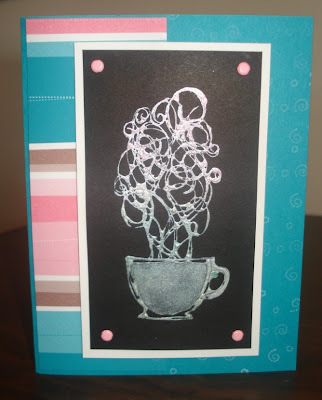 Card 2 uses a set from the Winter mini, "Like it a Latté", with a fun new technique called "Magic Rainbow". We painted the rubber with Lumiere, heat set it and then brayered a Spectrum pad over it. This last card uses the "Rock & Roll" technique for the base of the flower, and we also custom-coloured the ribbon using a sponge dauber. Love the buttons! I love the "It's Snow Time" card...a CASE for sure!